The cornerstone of every link building technique is an accurate and effective link prospecting. As a website owner it is also very important to know your target market. In most cases, the link prospecting is closely tied to a link building method. For example, you want to give your product to bloggers, so you need to find a blogger in your niche. Or you need a list of all universities around New York because you want to ask them for cooperation. 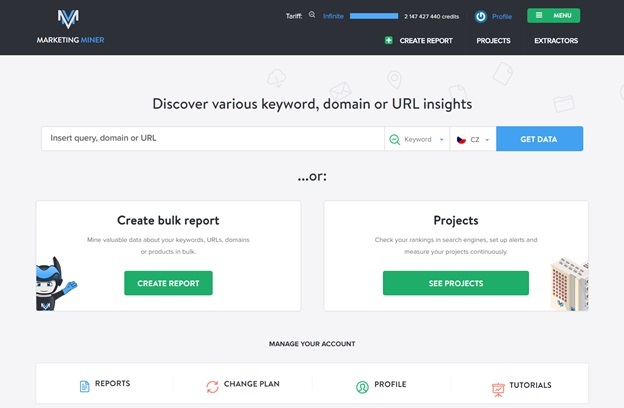 Every smart linkbuilder knows they need to have an overview of a website portfolio and also take care of it (update it, add new interesting websites, etc.). This process can take up a lot of time if you do not automate it. 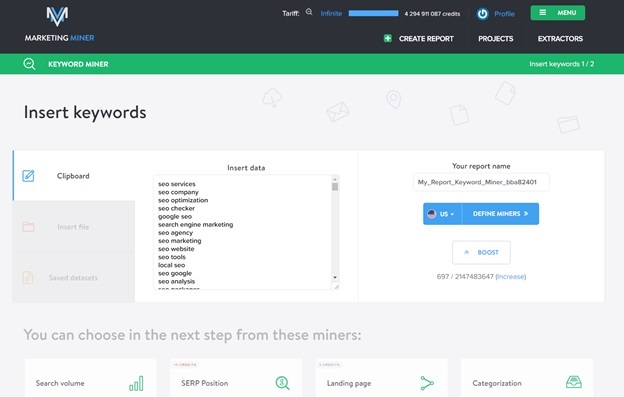 First of all, just a short introduction of what Marketing Miner is: Marketing Miner is a data mining tool for online marketers (especially for SEO specialists), it can mine important data for you from various sources, like Google search results, Majestic, AdWords and many more. In this case, we will first use link prospecting miner which mines data from the first 100 Google search results for multiple keywords. After data collection phase, it analyses these results and gives us the most commonly occurring domains and URLs (most influential websites in that niche). For our case, I want to know who has the most influential websites in SEO niche and contact them. For simplicity, I just used the output for one query from another Marketing Miner tool called Keyword profiler. Then you just have to choose the country for which you are making your link prospecting and click on Define Miners button. In the second section, you just simply check the Link prospecting miner and click on Get Data button and that’s all. Please note don’t use any filter there or miner will filter your results to just blogs, forums or other. There, you can see the most visible websites and URLs in my target niche. In my case I don’t need any articles so I just download an Excel file and use the sheet with websites or aggregated CSV with my results. If I sort these websites by the number of occurrences I see the most influential websites according to keywords I’ve chosen previously. Now we have a dataset of websites that are the biggest influencers in our target niche. First step is complete! Now, before we start with the mining of detailed information and statistics of these websites, we need to setup Majestic miner and connect Marketing Miner with Majestic. It is pretty straightforward – you just click on Majestic Miner in the process of a report creation, follow the link which Marketing Miner redirects you to and fill back in the Marketing Miner access token which Majestic generates for you. Now we’re prepared to mine data. Second step complete! Before we start digging the data of these websites, it’s good to cut the trash out from our input. A good method for that is to delete websites with small number of occurrences as they will not be relevant. In my case, I deleted websites with fewer occurrences than 25 which resulted in NUMBER of websites (raw input here). The process is very similar to our first case, now we just have a domain as input. So you go to the user dashboard, click on Create Report button and choose Domain Miners. As the input you use our websites (Marketing Miner and Majestic) and click on Define Miners. As you can see, we have all the data we have talked about in one place and we can now work with it and use it. Now you have hundreds of interesting prospects obtained in just a few minutes. The next step is slightly more complicated as it requires manually editing the data. You have to clean this data, delete irrelevant websites, fill empty contact details and check validity of output data from Marketing Miner. The first three steps with Marketing Miner and Majestic only took 5 minutes (the time you’re waiting for data is not included). With such data you can make informed decisions and use it as an important resource for your link building process. How does your link prospecting process look like? Do you use any data mining tools to fetch resources as well?